ORANGE PARK, Fla. - Seven months after a Clay County motorcycle deputy was killed in an on-duty crash, hundreds of people gathered to help the Sheriff's Office raise money to send his family and an honor guard to Washington for a memorial. More than 200 bikers took to the streets in Orange Park on Saturday to honor Deputy Ben Zirbel and continue their fundraising mission. There was pomp and circumstance leading up to the motorcycle ride kickoff, including a few somber moments. The Clay County Sheriff's Office honor guard raised the flag and presented the colors in honor of Zirbel. 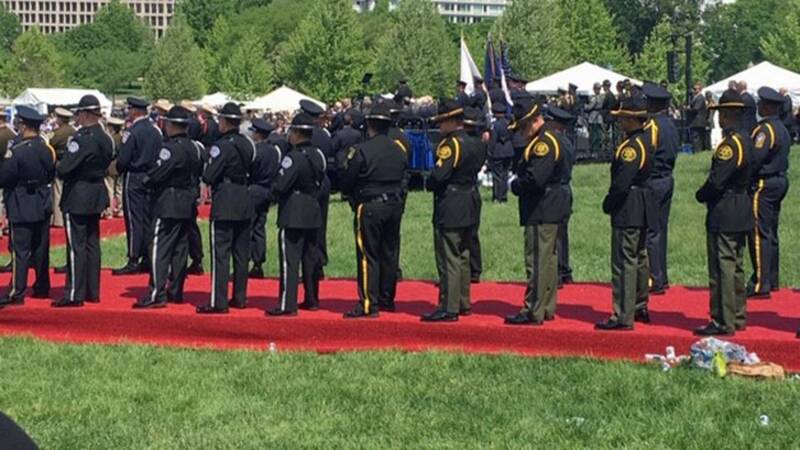 "Whenever the job needs to be done, he put effort into it and (would always) make sure things got taken care of for us on the honor guard," said Sgt. Matt Williams, with the honor guard. Fellow first responders and the Clay County community remembered Zirbel as a passionate motorcyclist. "He loved to bike. He had got it in a wreck a couple of years ago. He was on light duty for a while. He would help me out in the office and work in a detective division, and he was determined that he will get back on the bike. He did," Williams said. But another crash last summer, unfortunately, took his life. "When you hear the news of this and that he has the family, you would definitely think of your family and what they would go through. It definitely hits home. It's a very sad time. Still is," said Lt. John Taylor, with Clay County Fire Rescue. Hundreds of bikers gathered today in front of the Adamec Harley-Davidson in Orange Park for live entertainment, a silent auction and a raffle to raise funds for Zirbel's family and motor unit. With the ride registration alone, organizers said they've raised more than $6,000. "To show up today was amazing. Very exciting day to be able to raise the money for people to go and see officers represented in Washington, D.C.," Taylor said. Williams says it's difficult to remember that three months before the crash, he was standing alongside Zirbel at a national service in Washington to remember fallen officers. "Last year, we got to be part of the presentation for the president and vice president on national service on the Capitol lawn," Williams said. "Ben and I stood next to each other, side by side, right as the president and vice president came in and out. It's quite an honor." "We worked together for years, between working in (the Special Victims Unit) together, working in the honor guard as teammates," Williams said. "(He was a) really good man. I miss him." If you are interested in supporting the family of Zirbel, as well as this mission to Washington, D.C., in May to unveil Zirbel's name and end of watch date, 8/21/2018, on the National Memorial Wall, you can donate online.